It’s octatonic! 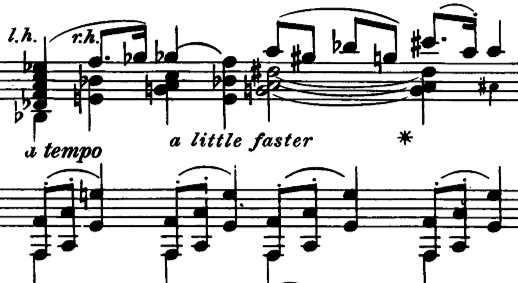 And with a whole-tone scale in the right hand and octatonic in the left, perhaps he was spelling out a larger-scale wedge motive. But he crossed out the second quarter-note and put a half-note. The realization that his original idea was not thematic but scalar gives me something new to look for in the piece. I’m considering teaching a Concord Sonata course next spring, and I’ve always suspected that if I could look at the sketches I could clear up, at least in my own mind, some mysteries about how Ives composed. And I’m grateful to the librarians here for allowing me to gaze my fill at these precious manuscripts. Have you considered doing a duo blog on this piece with Jeremy Denk (who has recorded both the Ives sonatas, and may be the foremost interpreter of them these days)? KG replies: I’m not sure what Mr. Denk would get from doubling up with a scurrilous reprobate like me. Actually, I prefer the C# half note at the end of Thoreau. It seems to end the movement with a question, and not an affirmation. KG replies: I think with the A it still sounds like a question, but a question left over from the previous discussion. Thanks so much for this post, a real eye-opener. It is a shame most scholars seem uninterested in doing critical editions of scores anymore; a genuine critical edition of the most important American composition for the piano would seem to me to be a pretty important thing, more important than discussions about whether Ives back-dated his manuscripts, or was homophobic or whatever. Obviously it would be a massive undertaking to compile and organize the variants, but it would be so valuable. It seems to me a four-hand blog on Ives with you and Jeremy Denk – or maybe with Marilyn Nonken (another extremely smart performer of this piece) – would be pretty fantastic. KG replies: In my official capacity as Vice President of the Charles Ives Society, let me say that the Society has an impressive number of critical editions in process at the moment, and some of them take forever because the textual issues in Ives are so difficult to untangle. The amount of devotion going into these projects on the part not only of scholars but performers and publishers is just phenomenal. I’ll look into the Concord Sonata issue. I’ve just learned there is an unpublished annotated version by John Kirkpatrick, and I want to do some work comparing the various versions myself. Sorry, I didn’t mean to overlook or disrespect the work of the Ives Society. I’ve studied a few of those editions myself and am grateful they exist. And I understand how huge a project preparing a variorum edition of the Concord would be. 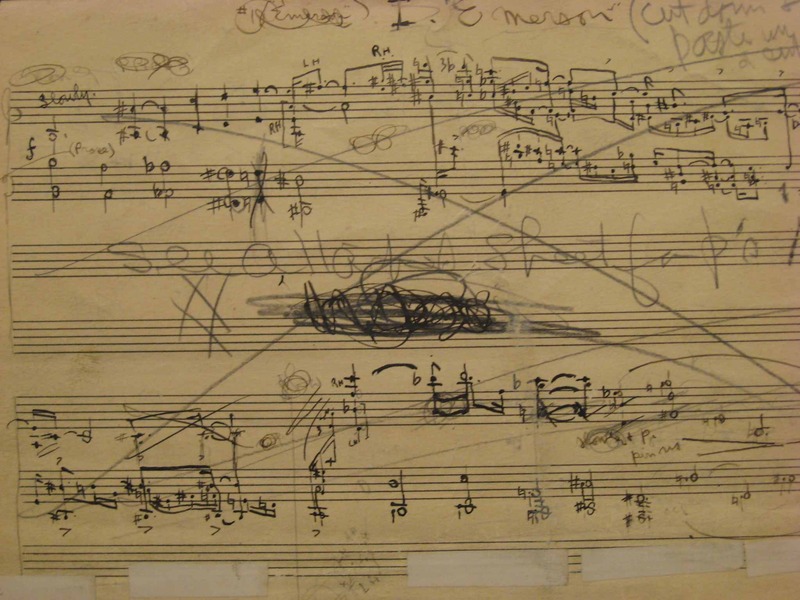 However, I do think that, in general, musicologists today see the preparation of editions as sort of an old-fashioned pursuit, less fashionable than doing critical theory, and the result is that there is less work done on preparing editions of 20th century repertoire than there should be. A critical edition of La Mer was prepared by the librarian of the Philadelphia Orchestra a few years ago, not by an academic scholar. And I have heard that Boulez has a list of errata for the score of Miraculous Mandarin that he supplies when he comes in to conduct it. He shouldn’t have to do that. So, bravo to the folks working on Ives scores for bucking the trend. * Need I note that the long-overdue production of an edition of the works of Johanna Beyer has come about by the volunteer work of a consortium of composers and the Frog Peak Press cooperative, not by musicologists and a University press? The posting as a whole is also relevant to this discussion.